Storybird is a brilliant collaborative story telling tool. The site has loads of artwork which you can use to tell stories and make a book. 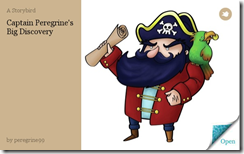 The book can then be published online and embedded into your website (see Captain Peregrine’s Big Discovery below). There are already loads of stories on the Storybird website and there are other sites that use stories embedded in them including stories in foreign languages. As part of a literacy campaign in your school why not put a different story on your website class pages each week? Teachers can also set up class accounts which are private areas for their pupils to collaborate on work or to complete assignments set by the teacher. And if you have the money you can have your books printed out! "Currently, Storybird embeds work on Blogger, Typepad, WordPress.org (self-hosted), Tumblr, Ning, and most other platforms that accept standard HTML. They do not work on WordPress.com blogs yet." Hopefully this will come shortly! Meantime, I’m afraid you will have to click on the image of the book. Storybird have their own blog and are also developing a Storybird app for the iPad.